People buy homes at all times of the year, but winter isn't the most fun time to be a home seller. Days are short. Weather can be unpredictable. Travel might be difficult or even unsafe. Schedules are cramped. And home landscapes lack the lushness and color of other seasons. If you live in the most southern states, where winters mean drinks by the pool and driving to work with the top down, selling a home won't be as challenging, but for most of the U.S., selling in winter takes special planning. Don't let the lack of sunshine, birdsong, and flowers bring you down if you're a wintertime property seller. Here are some simple ways to make your home stand out. to celebrate the winter season. What is special about winter where you live? Buyers judge your home from the outside, so landscaping is just as important in December and March as it is in June, maybe more so! One reliable budget formula is that spending 5% of your home's value on landscaping can get you an ROI of up to 150%. But if that money is spent on spring flowering shrubs, summer annuals, and colorful fall foliage plants, it's not a well-designed plan. Some shrubs that look interesting even when their leaves are gone are Japanese maples, witch hazel and red twig dogwood. Some shrubs that still look good during the cold month are hollies, boxwoods, evergreens. Even if the ground is frozen, your local nursery can supply you with small potted varieties of these plants to use as container plants near your entrance. Other containers can still add color with flowering kales and cabbages, and evergreen branches left from your Christmas tree or prunings from a florist. Even spray-painted bare branches in a bucket can serve as your front entrance spot of color. Take a serious look at your property in midwinter. Make sure fallen leaves, frost-bitten plants, dead tree branches, and downed limbs are removed. Mulch should cover beds that are resting. With cold temperatures and dreary skies, potential buyers can have a difficult time picturing what your home looks like in summer. For winter listings, it's important to include a photo showcasing your home in its best season to help them see how it looks at other times of the year. 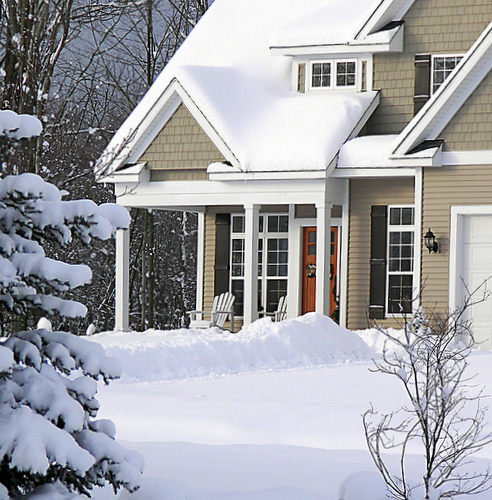 When potential buyers come to your house, will they have a clear path through any snow? Your driveway, sidewalk, and porch should all be cleared of snow and ice to not only make it look nice, but to make sure no one gets hurt walking to or from your house. Buyers don't need to be reminded of the work they will have to do to maintain a home. Please don't display a stack of snow shovels and bags of ice melt products. Keep them handy but out of sight. It's also important to make sure visitors have someplace safe and convenient to park their vehicles. If your home is still on the market during the "mud season" common in areas where thawing snow and spring rains make a mess of unpaved roads and paths, let agents know about conditions ahead of time so no one gets stuck. A place to put muddy boots and shoes just outside your front door and a box of disposable "footies" is a good idea. Realtors might be bringing clients to see your home after the workday is over, when it's dark. 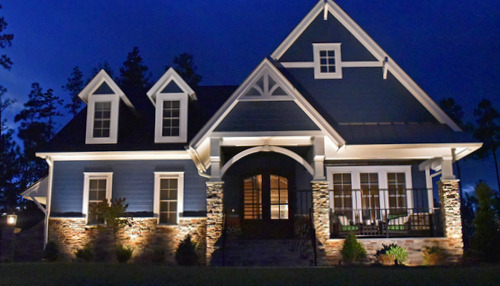 Motion-activated exterior lights are easy to install, especially if you can simply replace an existing fixture. Make sure all outdoor lights are functioning and have the maximum wattage recommended. It's possible you may not have sufficient notice of when your home is being shown. Perhaps you are traveling, working, or you've already moved. In these cases, you'll need some timers on lamps to guarantee that some rooms are pre-lighted when people arrive. Because the harsh winter weather can leave you stuck inside, it's a good time to tackle some easy upgrades. If you're not one of the 20% of Americans who feel happy with their home decor, according to a HomeGoods survey, make some decisions about how to change things to make your space feel as inviting and homey as possible. 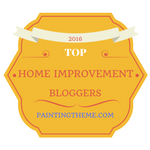 One budget-friendly way to do that is by painting your interior walls. 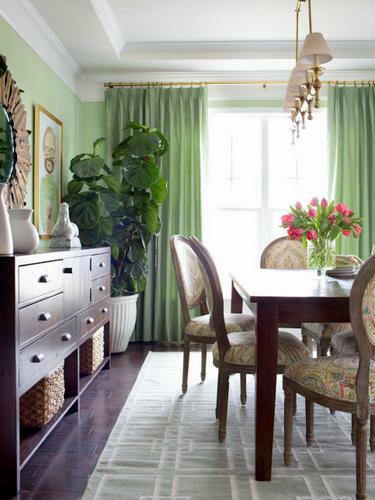 Choose colors that are in style right now, like warm greys, violets, teals, and greens, to attract trend-savvy buyers. Real plants and flowers can be part of your "lighten and brighten" campaign. Grocery store bouquets are inexpensive and can last more than a week if you know how to stretch your floral dollar. While selling during the winter can be discouraging, there are ways to make the most of the season's charms. The Danish have a word for it: Hygge, and it means coziness. According to The New Yorker, "It is candles, nubby woolens, shearling slippers, woven textiles, pastries, blond wood, sheepskin rugs, lattes with milk-foam hearts, and a warm fireplace." So, if you have a fireplace, make it a focal point in the room. Stage it with winter style. If you live near winter amenities like ski areas, winter festivals, seasonal tourist attractions, or special winter scenery, make sure your listings highlight those features. Keep your house interior comfortably warm. Potential buyers will feel immediately cheered by coming in from the cold. 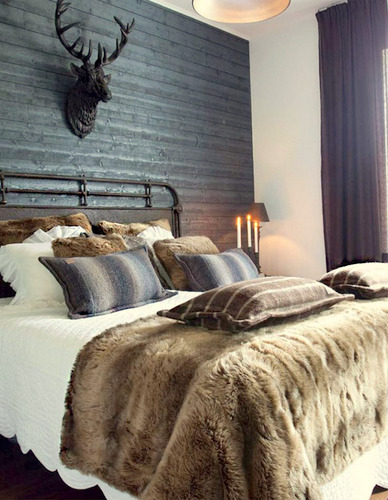 Here's a bedroom that emphasizes the cozy qualities of winter in a cold climate. But with the heat cranked up, it's important to ensure your home is properly sealed. If your attic is not properly insulated or if you have openings or air leaks, now is the time to take care of them. Doing so will not only lower your present energy bills but will produce a return on your investment when you sell. In northern states, buyers will often inquire about heating costs, so it's a selling point if your home is energy efficient. If your home is on the market in winter you're bound to have fewer showings, but all it takes is one buyer, so focus on that thought, and stage your home to attract that person. 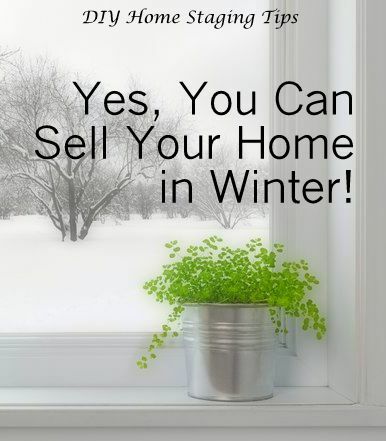 Selling during the winter months can be discouraging but not impossible! With a little extra lighting, a toasty interior, some reminders of the season's pleasures, and maybe a snowman in the front yard, you're sure to attract that buyer who's ready to make an offer. If you are selling any kind of home, at any time of year, you can get more tips on staging it in my $4.99 eBooks. 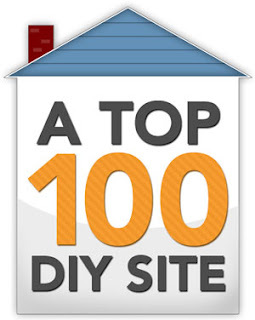 Download and start staging your way to a more profitable sale today.